Admire the stunning landscape of Turtle Bay from your lounge chair. Home-like amenities give you a warm feeling. Take a trail ride from the resort's own ranch. Enjoy a romantic meal or scenic breakfast overlooking the ocean. Why must a bike move, when it's already in the right place? It's the only resort on a spectacular stretch of sand. There are tons of kids' activities, fun pools, surf lessons, and horseback riding. Turtle Bay Golf borders the resort. Take a romantic stroll on the beach and admire the emerald cliffs of the bay. 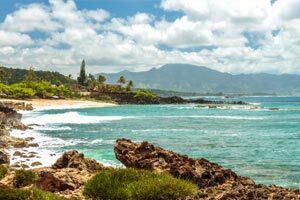 Turtle Bay is set on a gorgeous crescent bay on the northern tip of Oahu, a world away from the crowds of Honolulu; the resort is so spacious that it’s significantly larger than the entire area of Waikiki. You’ll find a working organic farm, a ranch with trails for horses, a long beach with room to spread out, and daily activities such as snorkeling and yoga on stand up paddle boards. You’ll have access to two outdoor pools and hot tubs. Jump in the pool for a swim, or lounge with a drink from the poolside bar and finish that book you started reading on the plane while the kids splash around in the children’s pool. The fitness center has everything that you need to get your cardio on; they also offer classes. Athletes will love the on-site tennis center, surf school, and the two championship golf courses: Turtle Bay Golf Club and Kalima Golf Course. The full-service spa features treatments for adults, kids, and teens. Treat yourself to a relaxing massage, facial, or body treatment. Kids and teens can experience a manicure, pedicure or facial. Makeup application and hair styling are also available. Air-conditioned studio-, three- and four-bedroom condos sleep four to ten guests and have more than enough room for the kids and all of their toys, pillows, and even a few imaginary friends. Full kitchens are perfect for family dinners around the table or dine at one of the three on-site restaurants. Each condo features high ceilings, Brazilian chestnut floors, in-suite washer/dryers and spacious private lanais. Cable TVs provide in-suite entertainment. Catch a sitcom rerun or the latest episode of your favorite show. Good news! Turtle Bay is a dog-friendly resort, so there’s no need to leave your four-legged family member behind. Visit the Polynesian Cultural Center for a day of family fun. Six different island presentations allow you to experience culture from the islands of Hawaii, Aotearoa, Fiji, Samoa, Tahiti, and Tonga. The Ali’i Luau is a celebration of cultural heritage that includes Polynesian entertainment and cuisine. Check out the Ha: Breath of Life Show where over one-hundred Polynesian natives dance with fire knives. The Hukilau Marketplace features a variety of unique shops. Tahitian Treasures has handcrafted Tahitian pareos and jewelry. Polynesian Wood Carving is where you will find handcrafted turtles and tikis. If you like jewelry, stop by Pearl Factory for white and golden South Sea pearls, freshwater pearls, Tahitian black pearls, and Akoya pearls as well as fourteen-karat-gold jewelry. Na Hoku has jewelry with diamonds and gems. Kids will love Amusement Ink, where they can get a fun air-brushed (and non-permanent) tattoo or have their face painted. Thanks to its 30-foot swells during the prime winter season, surfers have been flocking to these shores since the 1950s.